Effective resource management and optimization has remained a key concern of every application, with radar applications being no exception. 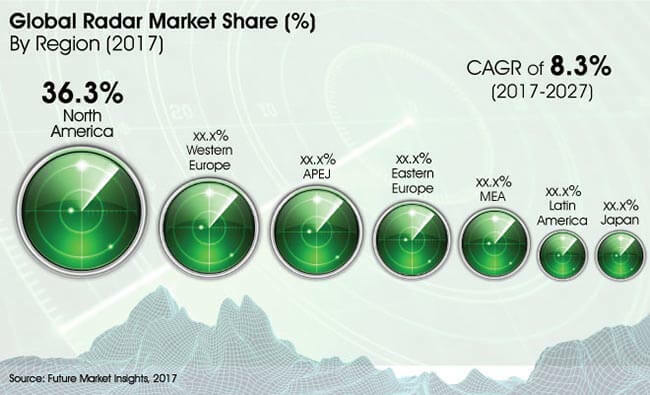 Optimized radar usage remains a prominent trend pervading in the radar market, translating into a massive influx of technologies central to this. Multifunctional resource and sensor management is widely acknowledged as a viable tool, which facilitates seamless assigning of resources by identifying the needs of particular radar tasks. Moreover, multifunctional resource and sensor management are also gaining high popularity, on the back of its competency in enhancing the overall radar system performance. The need to attain maximum operational efficiency is translating into an influx of innovations and developments in the radar market. Software upgrades in the radar systems have evolved as a game changer, enabling seamless scanning of the atmosphere and conveying low-level updates every minute or whilst active weather conditions. However, technology named “multi-function phased array” is also foreseen to rapidly gain grounds in the next 10 years, with the convenience of obtaining radar updates without the necessity of software tricks. Until the recent times, only government agencies had the authority to deal in space exploration and launch of satellites. All the private players who wished to deal in space exploration or launch satellites had to get avail services from governments. Since the past few years, private players got the green light to launch commercial space flights, which is swiftly pushing the adoption of space-borne radar systems. The use of satellites for applications including internet and GPS has been witnessing an optimistic growth, which is highly likely to have a positive influence on the overall demand for space-borne radar systems. Multiple organizations across the globe are highly investing in 3D radar systems, on account of an indispensable need to enhance performance and efficiency of operations involved. 3D radars are steadily superseding the 2D radars across multiple applications and industries, especially in defense and meteorological applications. 3D radar systems are being extensively used across multiple applications such as weather monitoring, military and surveillance systems, where high-precision based scanning is one of the most paramount functionalities. Widespread adoption of mobile command and control systems by defense forces has been increasing off late in Eastern Europe, owing to several features such as open architecture of software and hardware, mobility, less airlift requirements, widespread availability of common module set for command and control (C2) applications. Moreover, additional attributes such as prompt communication interfaces and assets and reliable LAN systems are also registering for high demand for mobile command and control systems. This surge in clamor for mobile command and control systems is likely to provide the much-need fillip to growth course of radar market. BAE Systems, a leading player in the radar market, launched a new iMOTR radar system in 2017, meant for mounting on an aircraft trailer to offer better mobility. The primary function of this radar is to examine and evaluate ranges of unmanned aerial vehicles and aircraft. Lockheed Martin Corporation, a leading player in the radar market, launched a new long-range discrimination radar in 2017 for detection of Intercontinental Ballistic Missiles (ICBMs). Northrop Grumman Corporation, a key player in the radar market, company launched a new scalable agile beam radar in 2015. This radar is as an affordable solution, a low-risk retro fit, offering upgraded operational capabilities and excellent system reliability. Rockwell Collins Inc., a prominent player in the radar market introduced a new inflight multi scan weather radar technology in 2014. This technology was meant to enable pilots navigate seamlessly in difficult radar systems, in a bid to minimize substantial flight delays or cancellations. This report provides incisive insights on the chronological growth trajectory of the market along with the present and future growth prospects present in the market. The report offers an exclusive analysis of the global market along with regional and segment based insights. The report offers an entire summation of the market including an official abstract that draws out the centre examples progressing in the market. It furthermore discusses on a couple of facets, for example, drivers, obstacles, and prospects that have been found in the global market. It also acquaints readers with figures related to volume, value, and development rate of the market from a growth point of view. With respect to market segmentation, each segment is analysed and presented in the report. It also gives an evaluation in light of the market circumstance, and moreover presents a value chain analysis of the products and applications in concern. A year to year progression of the market has likewise been offered in the report for the reader to be particularly aware of the changing scenario of the market. The report is the end result of the cautious research work of the market analysts employing reliable sources. The information introduced has been studied carefully by industry experts of FMI. The data that has been presented here has been assembled from various tried and tested sources. The figures have also been checked by the examiners and can be used to settle on key decisions and formulate strategies. Some of our sources are paid and some are online website and journals. We also consult leading figures in the field in order to understand the structure of the market. The market study conveys an immense outlook on the engaged scene of the overall radar market. It features the competition prevalent among the present vendors in the market and also puts weight on the future circumstance of the market. The profile of the players is based on a SWOT examination sought down by company angle, product portfolio, strategies, finance related information, and year-to-year projections. The organizations have been explored closely covering their key developments, innovations as well as mergers and acquisitions and agreements with other prominent organizations. The reports made by our industry analysts are credible and have been researched and validated from several primary and secondary resources. What makes us unique is the fact that along with presenting an analysis of the market’s historical and present scenario, we also present a forecast review of the market for the benefit of our reader. The presentation is unique in the form of various charts, tables, and diagrams. Every bit of information present in the market research report is unique. Expert opinions are also present in the report that can be directly used by the readers to make future decisions.